Starting in September, the Boston University College of Communication will be switching to a Bring Your Own Device (BYOD) policy, which will involve getting rid of most of the computer labs in COM. The decision to switch to a BYOD policy came from the minimal use of the computer labs, COM Dean Thomas Fiedler said. A question arose of how the spaces could better be utilized for new technology. Students are already coming to COM with the necessary technology, Fiedler said, and maintaining the computer labs has become outdated. “I believe the latest number is literally 99 percent of all our incoming COM students come in with their own devices,” Fiedler said. Fiedler said another strong factor in the decision to rid COM of some of its labs was the ability students now have to download the Adobe Creative Cloud onto their personal devices for free, thanks to a deal BU made with Adobe last year. Before this deal, Fiedler said, the labs were necessary due to the Adobe licenses connected to the computers in the labs. 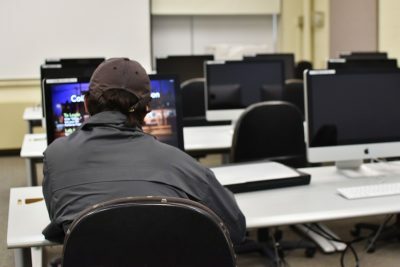 The expenses required to maintain the 11 computer labs in COM had become unjustifiable, since students were bringing their own functional devices, Fiedler said. Fiedler said one lab will remain open on the third floor of COM for any students who wish to work in that kind of atmosphere. Peter Smith, a professor of photojournalism in COM, said he thinks getting rid of the computer labs has long been a necessary step for COM to take. Smith said the labs prove difficult when trying to run his classes. His students are hidden from view by the large computers, making it hard for him to connect with them and teach them effectively. Christophor Cavalieri, a professor of television in COM, wrote in an email that the BYOD policy is simply the next step for COM in terms of technological advancements. “From a production standpoint, the majority of students are already editing on their own devices, so the user transition has been underway for quite some time,” Cavalieri wrote in an email. Although Cavalieri said he expects some problems during the switch to the BYOD policy, he wrote that he believes the COM staff is well-equipped to handle it. COM sophomore Antonia Frank said she won’t be affected by this policy change, as she has her own computer, but said other students who only own tablets or cellphones could be inconvenienced. Yet, she sometimes finds laptop use in class to be a disturbance. Fiedler said many other schools have already instituted similar policies. COM senior Christy Matino said she is not in favor of the new BYOD policy. Although she has the Adobe software downloaded onto her personal laptop, she sometimes prefers using the large Apple monitors in the labs to see the detail in her work when using Photoshop, InDesign and other similar programs. “I think having [fewer labs] is [going to] … not allow COM students to really fully access and create the best work that they can,” Matino said. Veronica Liu, a first-year graduate student in COM, said she is also opposed to COM getting rid of the computer labs, as she uses them almost every day. With changes like this one, Smith said, dissent from faculty and students is bound to occur, but it is time for a change. “Times change, technology changes, and our goal is always to make it so it’s more real-world, like industry standard,” Smith said. The COM website states that most of the computers in the labs will be sent back to Apple in exchange for credit that BU will use to buy loaner laptops. But Brad Fernandes, COM’s director of technology, wrote in an email that the college does not yet have a plan for what it will do with the iMac computers. The loaner laptops will be purchased using COM’s technology budget because it is uncertain how much money the college would receive from the equipment liquidator, Fernandes said. COM is committing to purchasing a set number of loaner laptops regardless of how much it gets in return for the iMacs. Getting rid of the computer labs will give COM more space for other technology, such as virtual reality, Fiedler said. “We think this is going to free us up to put technology money into the future, as opposed to maintaining the past,” Fiedler said. Fiedler said he hopes this technology will be made available by 2019. Oh are we getting rid of all the books at Mugar next? 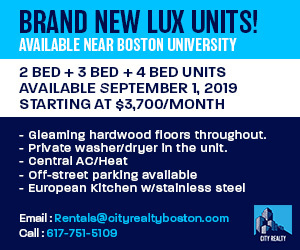 This is absolutely ridiculous and another example of the relentless classism that has enveloped BU. What about the other 20 percent of students who cannot afford to dish out thousands of dollars on equipment, on top of our ever-increasing tuition? Is this year’s 3.4 percent increase covering the removal of necessary tools for students? I have a phone with a cracked screen and a laptop that is going to be obsolete in four days because it doesn’t have enough memory for necessary updates. Every time I’ve used a COM computer lab, as I have multiple times a week for the last few years, there have always been plenty of the other students there. Often times, I would have to check multiple labs for an open computer. The thought of having to finish my education in a place that is actively turning away from the needs of people in my position is nauseating. How did they come to the conclusion that students rarely use the labs? was a survey sent out? I use computer labs all the time and I see several students whenever I’m there, even when I’m working past 12 a.m.
My laptop was almost rendered obsolete as well. My laptop is old, but in great condition. Besides years there isn’t much separating it from the capabilities of more recent technology that companies like Apple are putting out. Since I couldn’t get the most recent software update I wasn’t able to download the creative cloud onto my MacBook Pro. Basically, I had a completely functional piece of technology but would have had to buy a brand new laptop if I wanted to use programs like Premier for my class. A nice worker at the Apple store manually put the software on my laptop and told me he was doing me a favor and that if someone else had been helping me I wouldn’t have been leaving the store that day with the software. Even though I have the creative cloud now I am furious that BU is putting this extra stress on students. Companies like Apple make their money by keeping the world constantly up to date with enhanced pieces of technology. The cost of being up to date is purchasing every new laptop they start manufacturing. Is BU really going to put that cost on each and every one of it’s students? That’s outrageous. Just because this is an industry standard, it doesn’t mean that every one is financially equipped to make up for that. There are students coming here to learn the ways of the industry so they can eventually get jobs and actually make money so they can afford luxuries like expensive laptops. I came to BU because I loved the fact that they PROVIDED their students with all the best technology and tools they would need to have a great education.